In my last blog (see Full Key), I lamented on how I had deserted a Cantonese restaurant that I patronized for many years, but was re-inspired by a recent visit through its doors. Well, El Chalan fits in this category too (I guess I must on a type of memory/nostalgia lane this last week). It is so tempting to go the route of the food blogger chasing the latest food fad, most hyped restaurant, or the swankiest looking dining room. But instinctively, I prefer to stay on the path of the true-and-tested and those establishments who have been around long enough to have survived due to good cooking and their respect for culinary tradition. 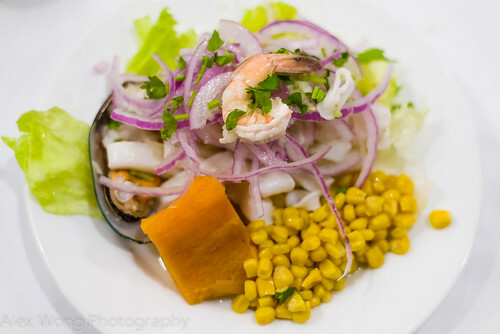 For this write-up, it took longer than usual to drive to downtown DC to reacquaint myself with this Peruvian establishment, perhaps due to an accident on the Beltway and the fact that I moved 30 miles away from this locale. Once there, I recognized the familiar unassuming front on a relatively quiet road (must be due to the holidays). 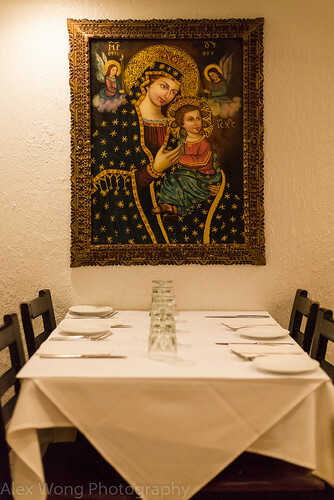 Walking in, I was pleasantly surprised that the basement restaurant was packed with diners and buzzing with a festive mood. I quickly found my friends and settled in for dinner in the dimly lit space (Photographers: ISO 5000!). Bucking my usual, I decided to order Chupe de Camarones. 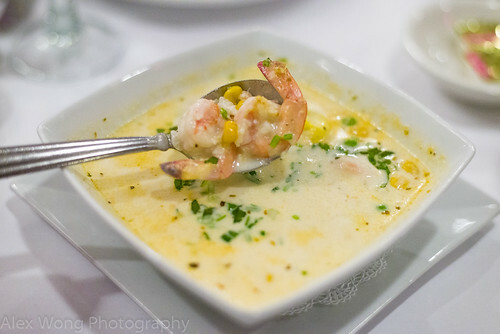 The bowl arrived filled with a creamy soup covering pieces of shrimp, corn, rice, potato, a boiled egg (Birdcage? ), and topped with a sprinkling of cilantro. The sip was akin to clam chowder but different in its thickness since it was lacking the consistency made from a thickener. The spoonfuls tasted light and the starch and corn bits added textural and taste interest to the broth. The pieces of shrimp were sweet but a little tough for my liking. The addition of pieces of boiled egg white and whole egg yolk was an oddity here, but somehow it worked in a strange way. 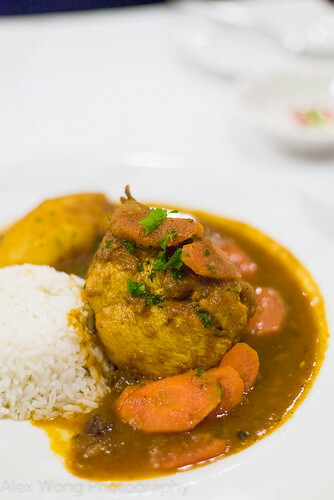 Staying within the realm of seafood as the appetizer, my dining companion ordered Choros a la Chalaca. A ring of opened steamed mussels arrived topped by a salsa-like combination of sweet onions, tomato, corn, bits of jalapeño pepper, and cilantro, all doused with a good hit of lime juice. 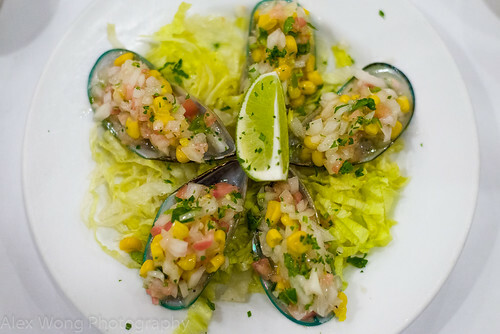 The mussel was fresh, plump, and mineral sweet, the salsa pungent, sweet, vegetal cruchy, and spicy, and the lime juice provided the strong citrus bite that made the seafood borderline cured by its acidity. Not quite the famous Ceviche, but a similar version. The other dining companion’s appetizer was from the land – Papa Rellena. 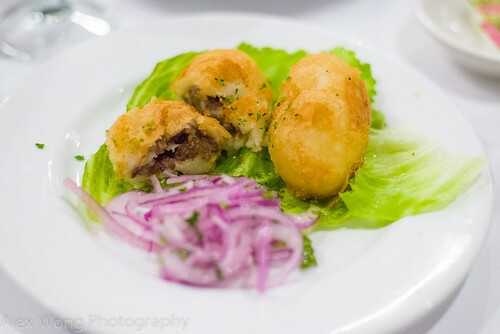 The dish arrived with a couple of croquette-looking pieces along with some pickled red onions. A bite into these fried balls revealed an outer layer of lightly-packed mashed potato with a stuffing of well-seasoned minced beef that was made exotic by a light touch of cumin. The coat of crunchy outerskin made them even more irresistible. The menu listed olives as part of the stuffing, and even though that was amiss in my bite, it was not missed due to the tasty meaty morsels. 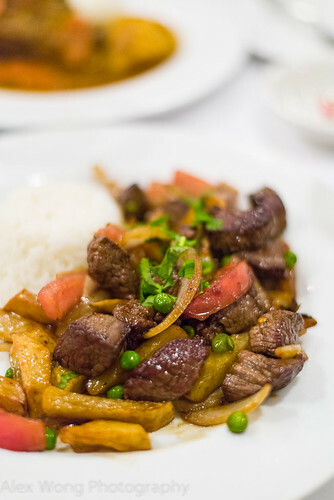 It seems that the same diner was in a beefy mood – for his main course, he ordered Lomo Saltado. The dish arrived with a waft of its tempting beefiness, displaying a melange of cubes of stripped beef, slices of white onion, tomato, and peas, studded with pieces of fried potato. A taste of my friend’s meal revealed the tasty, tender, and well-seasoned beef, sweet strips of onion and tomato, and the potato tasting home-made and cooked to perfection. But what brought the quality elements together was a thin coating of savory sauce that hinted of a touch of soy, adding a Umami mouth-feel. This dish is listed as the house special, and judging by the number of orders in the dining room, I understand why. From land to sea, at least for me. Continuing my mood for seafood, I decided to order an appetizer of Ceviche Mixto as my main course. The beautiful dish was brimming with pieces of shrimp, squid, scallop, and a mussel, accompanied by a large chunk of sweet potato and a heap of corn kernels, topped with rings of red onion. One bite into the dish and I knew this was the veritable thing. The squid was a bit tough, as well as the scallop, which was an indication of its lengthy “cooking” by the lime juice. Pieces of mild-tasting fish (red snapper?) were still slightly opaque but “cooked” enough to give it some fairly firm texture. A hint of chili pepper hit permeated each acidic bite along with some fragrant cilantro bits. To balance out the acidic element that could have overwhelmed one’s palate, the sweet potato and corn kernels were necessary in adding the sweet element. This is definitely a good rendition of Peru’s national dish and it brought me to the seaside villages dotting its coastline. We all are creatures of habit, and so is the other fellow diner at my table. His order without fail is Pollo al Vino. A piece of chicken breast has been slow cooked with some red wine and raisins, arriving with rounds of carrot and a boiled potato. From my tasting bite, the chicken was quite moist, the sauce tasty and hinted of a tinge of cumin, and slightly sweet from the raisins in it. This used to be my usual order and it was a nostalgic reminder of yesteryear. I must say that I can’t fault my friend for not being adventurous beyond this dish since it is still quite good and tasty after all these years. El Chalan has been around for 32 years in a prime downtown spot, and its survival all these years especially during the last economic meltdown is a testament to its reputation. The filled dining room during my last visit was a good indicator that diners still love this place, not for any novelty but for the very same dishes that they have been serving all these years. 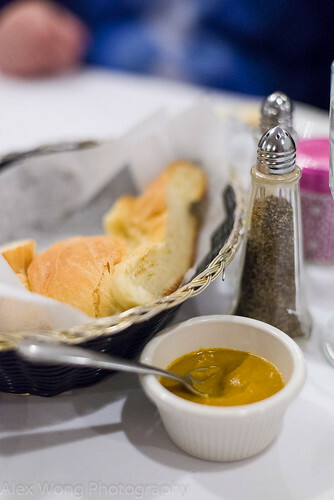 The kitchen has maintained its standards with its tasty traditional dishes executed well. Instead of chasing epicurian novelty, a sabbatical from very familiar dishes can inject a level of excitement back into the system and re-inspire the taster. El Chalan is definitely back on my list for more visits and reacquainting with its delectable menu.